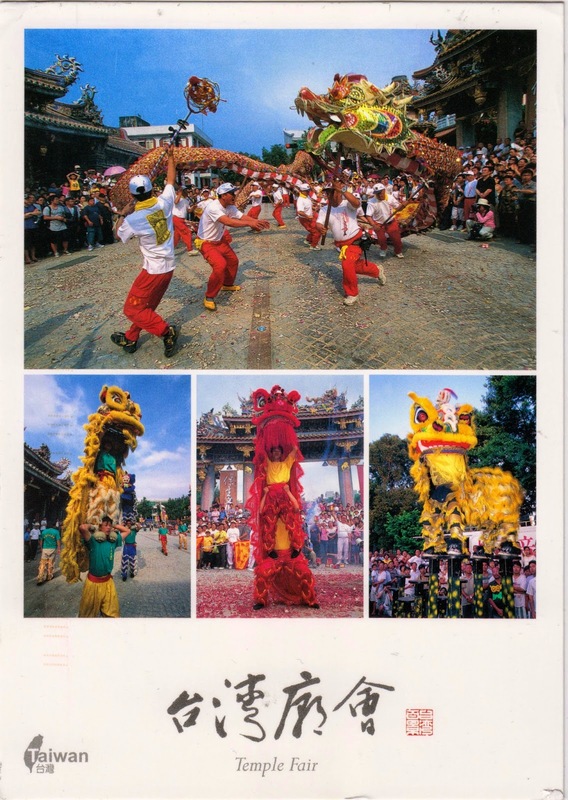 Postcard TW-1496908 from Taiwan shows scenes from a typical Temple Fair (廟會 in traditional Chinese or 庙会 in Simplified Chinese) in Taiwan. Temple Fair, originated from China, is a cultural gathering traditionally held near temples. In modern times, Temple Fairs are usually held in many regions throughout Asia during the time of the Spring Festival. Activities usually include worshiping Chinese deities, martial art demonstrations, folk art performances, and craft and food shopping. Today in its 21st year, the Chinese American Chamber of Commerce and the Chinatown Plaza in Las Vegas are jointly hosting the annual Chinese New Year Celebration and Asian Food Festival, similar to a traditional Temple Fair in all aspects except for being on a city plaza rather than a temple ground. The program features many traditional food and craft vendors, with dragon and lion dance, martial art, acrobats, Kung Fu, Hip Hop dance, and folk dance performances from 11 a.m. to 4 p.m.